Albert was born in 1893 and by 1911 lived in Station Street, Rainhill with his father, Frank, a broach maker and mother Emma. He had one brother, William who enlisted in the Royal Engineers and two sisters, Emma and Betsy. Albert was a booth forger working for Peter Stubbs. Albert enlisted as Private 1425 in the South Lancashire Regiment in February 1911 for four years. He served in France until 1916 when he returned to England on the SS "Duchess of Argyle" after being injured at Rouen. Station Street, Rainhill was the road were Albert Lee was living before WW1. 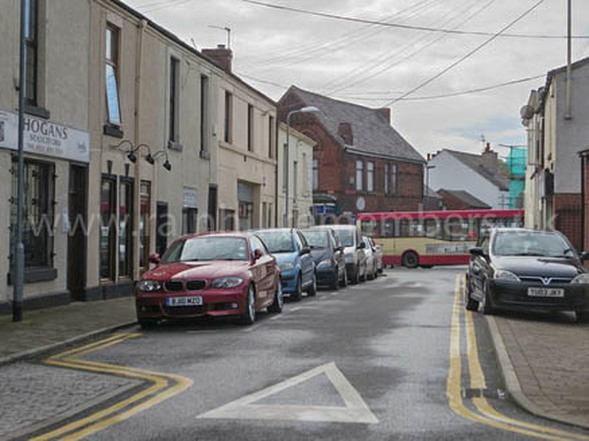 This is Station Street in 2015, a very different looking street, full of cars. The photograph was taken looking towards Warrington Road from Rainhill Station.